Contact us today for all of your options, more details, availability and schedule. Retail price for our new mechanical bulls is $19,000 plus the cost of delivery. Contact us for your pricing. 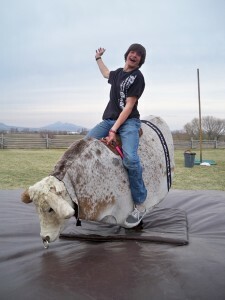 We have new mechanical bulls for sale (as well as used mechanical bulls). See our sales page for details about our bulls. A new bull comes with a full warranty and is built here in the U.S. when you order. We have several color options to choose from.